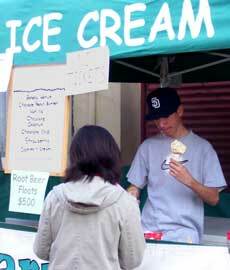 We love being in Normal Heights, but sometimes we also venture out to participate in outdoor events and festivals, to share Mariposa ice cream with others. We'd also like to share information about events in the community that we think our customers and friends might be interested in. 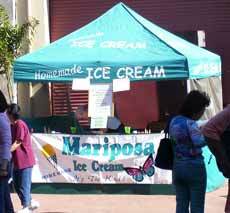 If you see an ice cream cone next to an event, we'll be there selling Mariposa Ice cream. Come on by and say hi! On November 22nd 2008 we held a special Beatles 40th anniversary concert on the roof of our building. We had The Dave Humphries Band and The Baja Bugs play great music all day long until the "Fuzz" showed up and told us to cease and desist. Click the Pic to the left.